Premier Showcase, founded in 2005 and headquartered in Chicago, is the nation’s leading talent resource for educators and assembly program directors. They currently offer both an online search tool and an annual one-day event featuring live performances. Search online at Premier-Showcase.com, the national directory. They offer a 24/7/365 online directory of the country’s best educational performers, motivators, and entertainers for the youth market. Premier-Showcase.com lists hundreds of talented individuals and groups ready to visit schools in your area and bring your assemblies to life. Their sophisticated search options allow program directors to quickly find exactly the kind of talent they want quickly — by location, category, and the audience’s educational level. Many performers offer slide shows or videos of their performances. Every September, they host a high-energy, one-day exhibition for entertainers, educators, and coordinators for the youth market. For attendees, the event is an opportunity to be entertained, educated, and introduced to the top performers in their region. 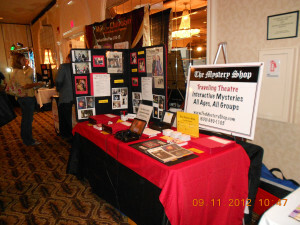 The Mystery Shop is at Table #4. Stop by and say hi. Ask about our special Showcase discounts.